VoIP can be a good solution for an alternative voice service provider. In this case subscribers connect to a class 5 softswitch that replaces the Local Exchanges in the classical PSTN networks. The majority of advantages you have as a Carrier are the advantages that come with Voice over Internet Protocol. Some of them are that the per user price is much less than in the case of classical telephony, the CAPEX and OPEX are significantly lower and the fact that a carrier can offer a larger number of services to its subscribers than in the case of PSTN. 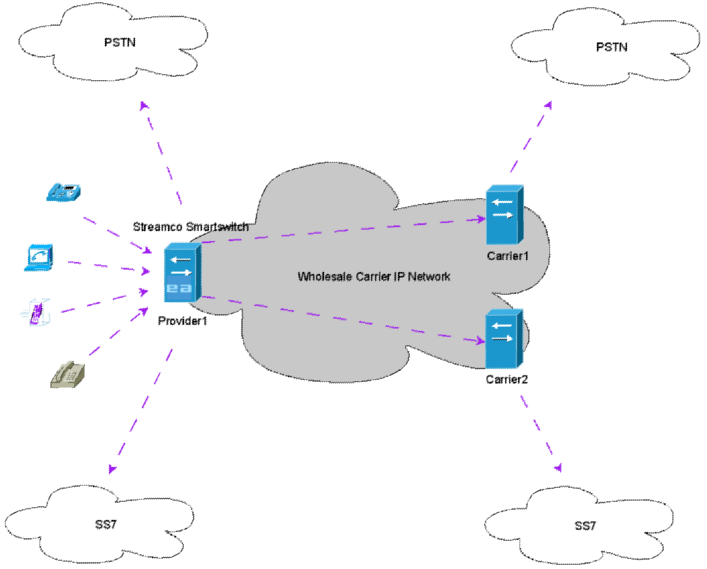 Streamco Smartswitch is "the brain" of the network registering the VoIP subscribers and controlling signaling and media. It knows, in each moment, the actual state of every device in the network. The alternative VoIP carrier can offer value added services to its subscribers - for instance VoiceMail, Unified Messaging or video calls by usage of IP video telephones. Using the billing engine of Streamco Smartswitch the carrier sends the billing information to its subscribers exactly as classical PSTN carriers (or even more). Carrier1 acts as Service Provider. He uses Streamco Smartswitch, that is is attached to PSTN and SS7 networks to provide local calls services. And he has contracted agreements with Carrier2 and Carrier3 for long-distance calls. Carrier1 uses routing capabilities of treamco Smartswitch to make calls as cheap as possible.